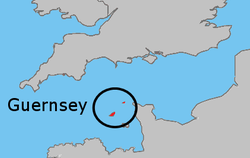 Is e eisimeileachd a' Chrùin aig an Rìoghachd Aonaichte anns an Roinn-Eòrpa a tha ann am Bàillidhneachd Gheàrnsaidh (Beurla: Bailiwick of Guernsey, Fraingis: Bailliage de Guernesey). Is e eilean a tha ann an Geàrnsaidh agus tha e na laighe mu 48 cilemeatair air falbh bhon Fhraing neo 121 cilemeatair bho Weymouth / Sasainn. Tha St Peter Port na prìomh-bhaile. Tha Geàrnsaidh cliùiteach airson seòrsa bhò sònraichte ris an canar Guernsey Cattle. Còmhla ri Deàrsaidh canar Eileanan a' Chaolais riutha. Air a tharraing à "https://gd.wikipedia.org/w/index.php?title=Guernsey&oldid=511638"
Chaidh an duilleag seo a dheasachadh 31 dhen Fhaoilleach 2016 aig 21:26 turas mu dheireadh.